This past weekend winter decided to show up to my small West Virginia town. 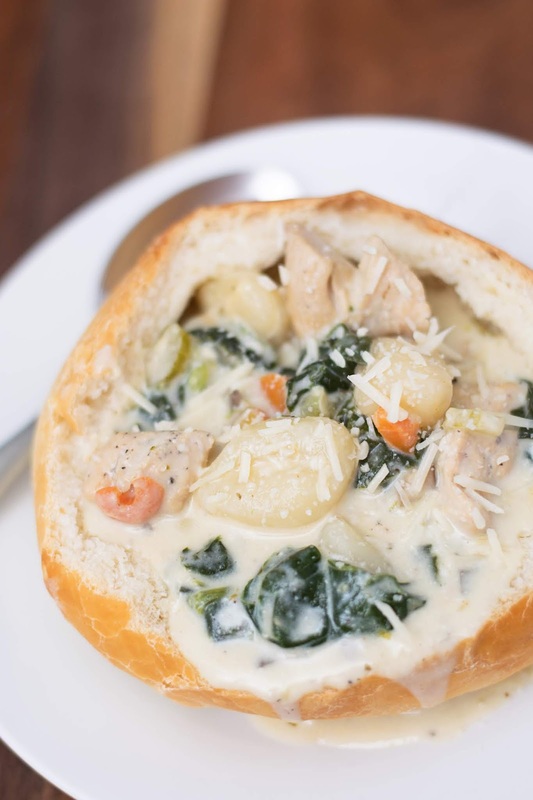 We got about three inches of snow, so that can only mean one thing...soup for dinner. I was looking through the Soup and Salads portion of my menu and I came across a Chicken and Gnocchi Soup with Spinach that I published back in 2014. As I become more skilled and confident in the kitchen I like to go back and update some of my older posts and this one could definitely use an update! I wish I could tell you this is one of those quick 30 minute meals, but it's not. All in all this will take about an hour, but I will share with you slow cooker options at the end of the post. To get things started you will need to dice your chicken. You can use dark or white meat for this dish, but it's also hearty enough without the meat if you want to keep things meat free. Liberally season the chicken with some salt and pepper. Chicken is one of those flavorless meats so it can handles the seasonings. Now place your soup pot over a high heat and add the oil. Once the pan is hot add the chicken and cook until brown and no longer pink, about 10 minutes. Once the chicken is fully cooked remove it from the pot and place to the side on a plate. Now you will add the carrots and celery. I like adding these first because they take a little longer to get tender. Cook for 2-3 minutes until tender. Now you will add the onion and sauté 1-2 minutes until soft and translucent. After that you will add the mushrooms. Cook for 1-2 minutes until browned. I know that mushrooms are an acquired taste, but two things. One, if you mince these up finely they will cook down to the point where you will not even know they are in there. Two, they add this rich umami flavor that takes this soup to a whole other level. At this point I like to add the spiced and let the heat from the pan wake up to dormant oils. This will give you the biggest bang for your buck in the flavor department. It's not time to add the garlic and cook just long enough to smell it coming up from the pan. Give everything a nice stir and bring it to a boil. Once your soup comes to a boil, lower the heat to a simmer, cover, and let cook for 15 minutes. This will allow all of those great flavors you've been building to come together and flavor the broth. After 15 minute you will add the gnocchi to the pot and cook according to the directions on the package. Once the gnocchi has finished cooking you will add the entire bag of baby spinach. I know you are thinking that is A LOT of spinach, but trust me when I say it will cook down and it's just the right amount. Let it cook for 2-3 minutes until wilted. I like to let me cream sit out while I am making the soup and come to room temperature. This helps it keep from separating when it hits the bot broth. 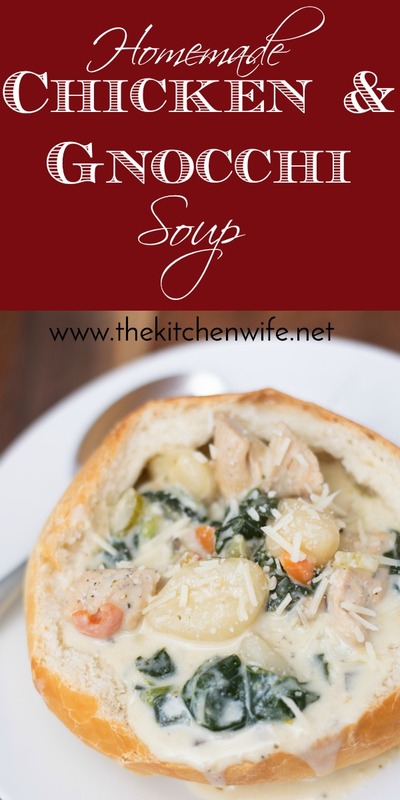 Stir everything together and let simmer for 5-10 minutes until the Chicken and Gnocchi Soup is nice and thick. 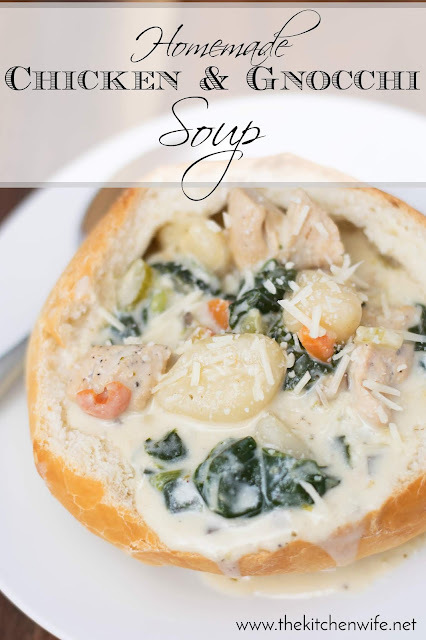 Serve it up in your favorite bowl and you're having a DELICIOUS Homemade Chicken and Gnocchi Soup for dinner tonight! I love how silky and creamy this soup is and those mushrooms give it this flavor that is out-of-this-world. I dare say that it's even BETTER than it's Olive Garden counter part! Add the fully cooked chicken, carrots, celery, onion, mushrooms, garlic, and broth into the crockpot and cook on LOW for 6-8 hours. 30 minutes to 1 hour (I recommend 1 hour) before you eat add the gnocchi, heavy cream and parmesan cheese. Give everything a stir and turn the heat to HIGH. Let simmer. Just before you eat add the spinach. Whether you make it on the stove top or in the slow cooker, I know you're gonna go CRAZY over this Homemade Chicken and Gnocchi Soup so get in the kitchen and give it a try TONIGHT! This Homemade Chicken and Gnocchi soup may just be better than the Olive Garden classic! 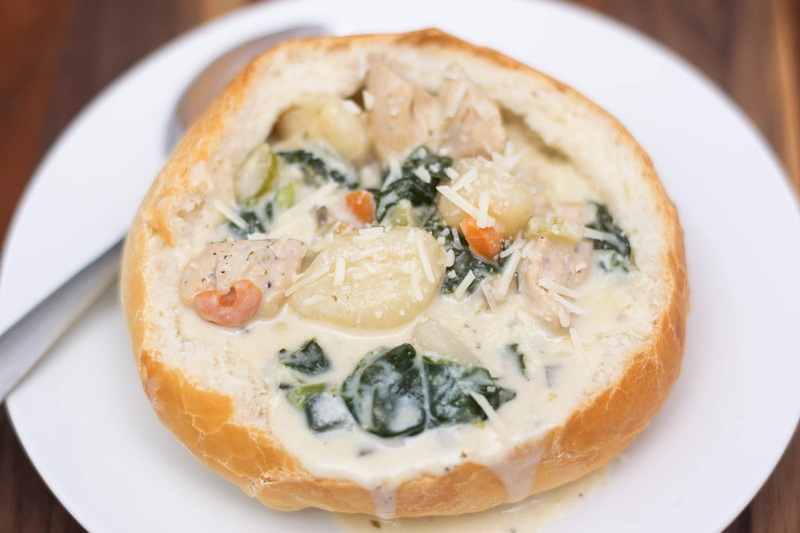 Filled with chicken, gnocchi, and loads of hearty vegetables it's the ultimate comfort food! Season the diced chicken, liberally, with salt and pepper. Place a soup pot over HIGH heat and add the oil. When the pot is hot add the chicken and cook until brown and no longer pink, about 10 minutes. Once the chicken is fully cooked remove from the soup pot and add the carrot, celery, mushrooms, onion, and garlic. Cook 3-5 minutes minutes until soft and translucent. Add the salt, pepper, and Italian seasoning. Stir into the vegetables and cook for 1-2 minutes. Return the chicken to the pot and add the chicken broth. Bring to a boil. Once the soup has come to a boil lower the heat to simmer, cover, and cook for 15 minutes. After 15 minutes add the gnocchi to the soup pot and cook according the directions on the package. When the gnocchi has fully cooked, pour in the heavy cream* and add the parmesan cheese. Stir and let simmer until the soup becomes thick and creamy. Add the spinach and let wilt, about 2-3 minutes. 1. Cook the chicken in a pan until brown and no longer pink, about 10 minutes. 2. Add the fully cooked chicken, carrots, celery, onion, mushrooms, garlic, and broth into the crockpot and cook on LOW for 6-8 hours. 3. 30 minutes to 1 hour (I recommend 1 hour) before you eat add the gnocchi, heavy cream and parmesan cheese. 4. Give everything a stir and turn the heat to HIGH. Let simmer. 5. Just before you eat add the spinach. *Set out the heavy cream while cooking the soup to come to room temperature.